A modest pre-F1 career, he put in a few appearances in F3000, with a best finish of 8th, before winning the open Fortuna by Nissan championship in 1998. I humbly confess to having never heard of such a category. He brought Telefonica sponsorship to Minardi for 1999, spectaularly fought with Irvine and Hakkinen in the European GP- earning a great underdog point for Minardi, before racing for Minardi again in 2000. Telefonica then withdrew for 2001, leaving Gene looking for a drive. He was signed up as a Williams test driver, with whom he remained for the next 4 seasons from 2001-2004. The FW25 was designed by new incumbent Antonia Terzi alongside existing designer Gavin Fisher. The car was generally uncompetitive in championship terms early in the season suffering from understeer, until a wider front tyre introduced by Michelin for the Monaco GP unlocked the car’s potential. Williams dominated the middle of the year, mounting challenges in the drivers and constructors championships before Ferrari recognised the threat and launched an inevitably successful protest against the wider tyre. The slimmer tyre was reintroduced for..the Italian GP- Gene’s debut, and Williams never won another race that season, although at that time, the BMW was considered a strength on the power tracks and Montoya ultimately qualified and raced in 2nd, splitting the Ferrari’s and finishing 5 seconds down on Michael. Williams ultimately won 4 races with the FW25, finishing 2nd in the constructors championship, with Montoya 3rd, Schumacher 5th, the car finishing routinely within the top 8 throughout the year. The FW26 sported the famous “walrus nose”. Williams expected to build on their form in the latter part of 2003 and win the title, but the car proved inconsistent, and regularly outpaced by the Ferraris, BARs and Renaults, leaving them in the upper midpack, but no more. 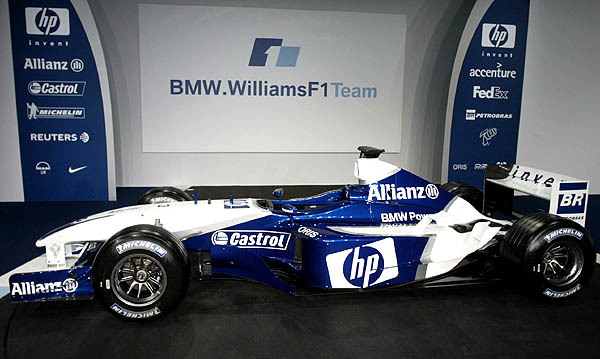 For Hungary, Williams redesigned the car along with the front section and improved significantly, leading Montoya to win the final race of the season- Williams’ last for 8 years. This was the final car to be designed under the supervision of Patrick Head. Gene was again drafted in after the USA GP when Ralf Schumacher suffered another major accident. At the French GP He qualified 1 tenth down on Montoya (P6-P8) and finished 10th, 15 seconds behind Montoya in 8th. At Silverstone, Gene qualified 13th, Montoya 8th, 1 second up the road. In the race, Gene finished 12th, 22 seconds behind Montoya in 5th. Watching the lap, you can just taste the adrenaline pumping! (aided in part by that high-revving BMW) An all time career high. Hardly. Qualifying 1 second behind Montoya in 13th in Britain wasn’t brilliant, and he was never really a match for Montoya at any point during his 3 races with the team, despite all the experience he had testing the Williams, but he handled himself competently across his three weekends. Realising he was out of contention for a race drive for 2005, and with FW wanting a driver clear out, In November 2004, Marc Gene moved on to become a Ferrari test-driver for 2005. Gene entered the sport with plenty of sponsorship but little by the way of reputation, until ironically, he performed unexpectedly well at Minardi only to lose his sponsorship and drive. He was never considered a prime contender for a race seat with Williams, so when you look at his performances relative to Juan Pablo Montoya during his 3 weekends, it’s pleasantly surprising. There was nothing brilliant about his ultimate speed, but his level of driving was extremely respectable- and a lot better than anyone could reasonably expect under the circumstances. His 3 race weekends for the team were extremely professional and mature. Marc Gene contributed to the WIlliams BMW era as their test driver for 4 years, during which time Williams secured 10 Grand Prix Wins and a championship challenge thwarted only by politics. His other major contribution was singlehandedly making the difference between 3rd and 2nd in the Constructors Championship, finishing 5th in his sole race appearance for Williams, and scoring those crucial 4 points that made all the difference in beating McLaren in the constructors championship, 2.5 years since he last raced a Grand Prix car in anger. And who said one off drives never work out? You could call it a case of lucky timing in a great car, but I think that sells Gene a long way short given the circumstances. Nice one Marc!